Application: Administered to the feed Allergicur leads to a healthy and normal response to allergens. Therefore Allergicur can be used in allergic reactions associated with itching and scaly skin. Especially in skin allergies, such as summer itch in horses and feed and / or flea allergy in dogs or cats. 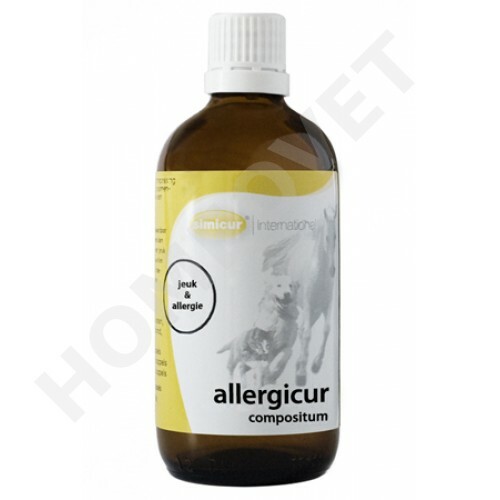 Allergicur is also applicable in case of hypersensitivity of the lungs and respiratory tract (allergic asthma) and allergic hypersensitivity of intestines (bowel spasms). Effect: The anti-inflammatory effect of Apis mellifera, especially to allergic reactions in the body is supported by the healing properties of calendula and the strengthening effect of carbonate mineralis on the connective tissue. Note: horses that are prone to tail and mane eczema is the use of already well ahead of the summer to be treated (in March) with Allergicur to develop any allergic reactions. It is advisable to treat these horses during the summer (until September), in combination with SIMICUR skin oil for the itching. Note: A few days after the start of treatment, an exacerbation of symptoms, such as hives or worsening of cough. This aggravation is a temporary phenomenon, but it is reasonable in these cases the treatment suspend 1-2 days to then continue the same treatment.